Immortal Performances will soon issue a two-CD set with Jussi. It has already had two comprehensive positive reviews, click here. The first CD contains Manon Lescaut fron the Royal Opera 1959 with Jussi. Hjördis Schymberg and Hugo Hasslo and is perhaps Jussi’s best recorded Manon Lescaut! The second CD contains songs and arias not previously issued to some great extent, incl. Förbi, Förbi (Kuda, kuda) from Eugene Onegin from Gothenburg 1960 and O holy night from Södersjukhuset 1954. The society will come back with information on how to buy the set most conveniently. Click here for further information from Immortal Performances. 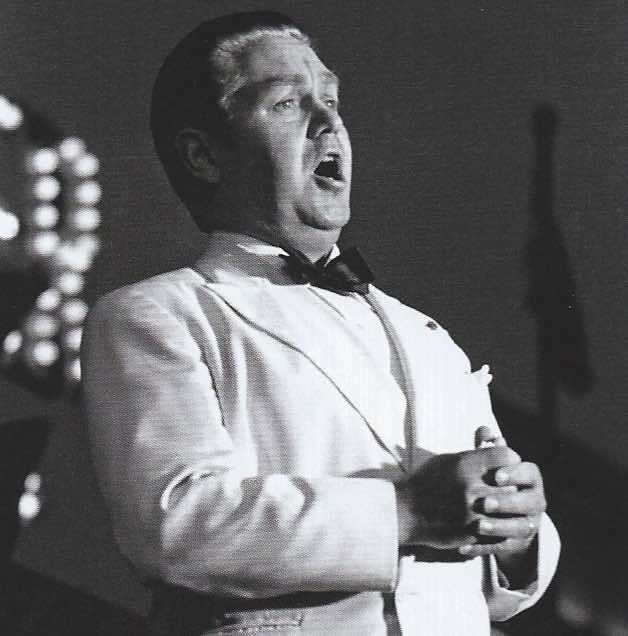 In July 1934 23-year-old Jussi Björling was already well established at the Stockholm Royal Opera, and the previous summer his international career had started with a guest appearance at Tivoli in Copenhagen. This summer there were no less than five concerts there (11-21 July), and in connection with these an outdoor concert in Malmö’s "People’s Park" some days earlier. Many new roles at the Royal Opera in Stockholm were waiting. Among those we associate with the “grown-up” Jussi he had so far done the main parts in Rigoletto, Romeo and Julia and Tosca, and one solitary performance of Un ballo in maschera. 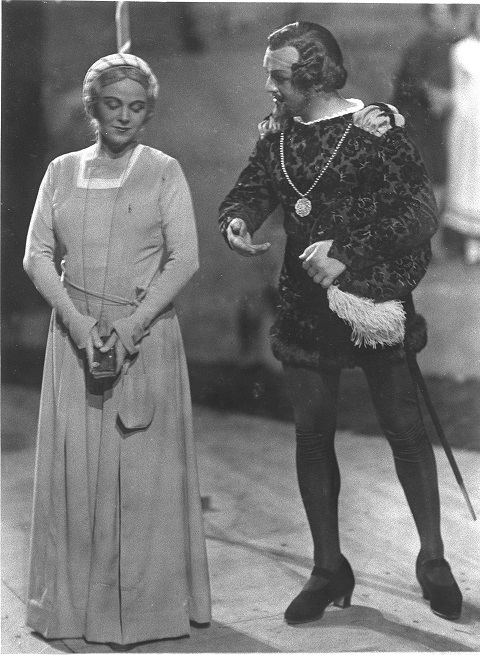 In addition he had done a large number of parts he would later relinquish, like Alfredo in La traviata or Vladimir in Prince Igor – in fact one of the roles he sang the greatest number of times. Waiting for him now were Faust, Bohème, Il tabarro and La fanciulla del West, all of which he sang for the first time in the autumn of 1934. In “Jussi of the Month” January 2019 we followed Jussi Björling to Helsinki and Tampere. But he was then already booked for new appearances at the Opera in Helsinki in March the same year, and then for a cause that was very important for Finnish opera lovers: the building of a new opera house in Helsinki. Opera had been played in Helsinki to and fro since the mid-19th century, but then by visiting opera companies. However, from 1873 the newly started Finnish Opera gave regular performances, until 1879, but then they had to close down the activities due to financial problems. It was revived in 1911 by Edvard Fazer, Oskar Merikanto and Aino Ackté. To begin with it was named the Domestic Opera but from 1914 until 1956 it was the Finnish Opera. The first years they played at the National Theatre, close to the Railway Station, but from 1918 they were located to the old Russian Alexander Theatre. 330723 Helsingør / Helsingör / Elsinore (Denmark), Hotel Marienlyst. 450817 Örebro, Idrottsmässan / Sports Fair. 460914 Stockholm, Grand Hôtel Royal, Spegelsalen / Hall of Mirrors. 480929-2 København / Köpenhamn / Copenhagen, Den kongelige Skydebane / Kungliga skjutbanan / The Royal Shooting Association. 490725 Stockholm, Världssportutställningen / World Sports Exhibition. “The tenor sphere provides a strong temptation for many prospective male singers. Few feel however from the beginning comfortable with the heavy demands for range, equalisation, tone quality, brilliance and beauty of the tenor repertoire. Few are, so to speak, born with the so called tenoral gift. This is something one has to acquire in due time with the goal of one’s dream in sight. One of the world’s leading record collectors each autumn publishes an auction list. In late 2018 it included a unique, private record of Jussi: a version of “Nessun dorma” from Turandot with a dedication and signature. The recipient of this 78 rpm disc had a name unknown to us or the auctioneer, and the record was privately made with the same contents on both sides. There was no applause but an English announcement at the end. Jussi was proud of being of Finnish descent and he visited Finland on numerous occasions. During the war he sang at charity concerts several times and in 1951 he was happy to meet Sibelius at his home in Ainola, outside Helsinki. After all the long tours for many years, not least across the North-American continent, he was at times rather tired of travelling, but to Finland he always travelled with pleasure, as he told a Finnish journalist. In January 1955 he had an opportunity to return to “the land of the thousand lakes”, but before that he was booked for a Tosca performance at the Stockholm Opera on 14 January. In September 2018 Göran Forsling wrote about the Björling brothers’ first visit to the US in 1919-21 . One episode which has always fascinated me and which he himself told about was when he and his brothers refused to hear Enrico Caruso at the Metropolitan Opera House in New York. Caruso undoubtedly was an idol for Jussi’s father David, and would later become one for Jussi as well. A direct connection would thus have symbolic importance. So how did it (not) come about? The father and his three sons arrived in New York on 28 October, with an initial concert on 20 November. Harald Henrysson’s research tells us that they remained in New York throughout December for a total of eight concerts, three of them as excursions into nearby New Jersey. They would stay in the US until spring 1921. After a long an intense spring season 1959, which began at the London Palladium on 4 January and was finished at the Royal Albert Hall on 31 May, and in between encompassed numerous travels across the American continent, Jussi was in need of winding down during the summer months. Besides a couple of minor assignments in the Town Hall, the traditional singing at Skansen on the National Day of Sweden and a concert at Gröna Lund, the amusement park in Stockholm, he was able to spend his time with his family at Siarö and catch a pike or two in the Siarö Strait. There was also a break for the recording of Puccini’s Turandot, together with Birgit Nilsson and Renata Tebaldi in Rome in July. 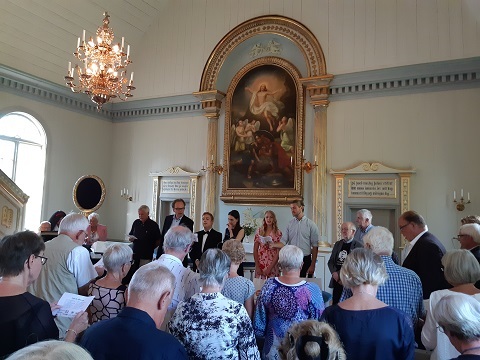 At the 13th annual Jussi Björling Festival at Strömsbruk on 1 – 2 September there was a special treat to have 25 members of the American Jussi Björling Society in the audience, celebrating their 20th anniversary. Their chairwoman Janel Lundgren was also there, together with our chairman Bengt Krantz and the British Society’s chairman Richard Copeman. Also present, to our delight, was Jussi’s daughter Ann-Charlotte and her husband. Twelve and a half minutes from Verdi’s Un ballo in maschera with Jussi Björling from October 1940 may help us to understand something which has left few audible traces: his US performances in opera outside New York. House in New York as the centre of his activities. When David Björling made his three sons Olle, Jussi and Gösta appear at a concert in the Trinity Church in Örebro on 12 December 1915, nobody could anticipate, least of all he himself, that the three boys (and David) during the next 12 years would carry through almost 1000 concerts throughout Sweden and also in the US. The start of the touring activities was of course delayed half a year, but after a settling-in period in July 1916 in the former hometown Borlänge, followed a month later by a handful of concerts in the neighbouring town Falun, the artist life was already in full swing. The first two years were primarily spent in Dalarna and the surroundings, but bit by bit they widened the circle. When David and the boys in autumn 1919 sailed off to the big country in the west they had already explored large parts of Mid-Sweden and were experienced artists and travellers. On 16 July The Jussi Björling Society and The Birgit Nilsson Society jointly arranged their annual summer concert at Kungsträdgården (King’s Garden) in Stockholm. On the stage photographical images of the two Swedish mastersingers looked out over the assembled people. Clas Remminger from The Birgit Nilsson Society greeted the audience and introduced the three vocal soloists: soprano Hanna Husáhr, born in Jussi Björling’s birthplace Borlänge, young tenor Manuel Bjelke, son of the late tenor Lennart Bjelke, and baritone Bengt Krantz, chairman of The Jussi Björling Society. They appeared in turns and together they presented a programme full of variety. For further information, see review in Swedish. A lot was the same as ever when the eighteenth edition of the concert honouring Jussi Björling, jointly arranged by The Jussi Björling Society and Ovanåker Parish, started. The first to appear was the magnificent bass Staffan Alveteg with a mighty aria from Handel’s “Messiah”. Next we encountered the young Norwegian soprano Ida Katrine Hagen Johansen, who sang “Jeg elsker dig” and Solveig’s sang”. She was followed by her compatriot and husband-to-be, tenor Bror Magnus Tødenes, last year’s Jussi Björling Prize Winner. He added to the Grieg repertoire with a brilliant and inward “En svane” and then captured everyone’s hearts with the most enchantingly beautiful reading of Sjöberg’s “Tonerna” imaginable. Time for change of scenes and now Lena Rieback took over the grand to accompany her disciples from Bollnäs Music and Drama, the musical artists Hanna Ingesson and Henrik Jingåker. One is amazed about the vocal resources and expressivity of these youngsters! Later in the evening at Voxnabruk Mansion, Nils-Göran Olve had a conversation with Bror Magnus Tødenes, who had many wise points of view on his life as singer. The evening was rounded off by “Listen to Jussi” with Harald Henrysson as DJ. On Tuesday morning Nils-Göran recounted for the life of another great tenor, Luciano Pavarotti. For further information see review in Swedish. In May 1935, there was a festival atmosphere in Stockholm, since the wedding between Princess Ingrid of Sweden and Crown Prince Frederik of Denmark would soon take place. On the first day of the month, Jussi made his first contribution to the royal frenzy with a special wedding record, carrying the portraits of the royal couple on the label. The two tunes were Bröllopsvalsen (The Wedding Waltz) by the Dane Michael Christgau and Lilla prinsessa (Little Princess) by Georg Enders, born in Bohemia in 1898 but living in Sweden since 1921 and active as pianist, conductor and composer. The conductor was Sune Waldimir, as he had been in 1933 for four popular tunes with Jussi (two of them as "Erik Odde") and would be in 1944 for two special wartime songs, and in 1953 for the movie Resan till Dej (The Journey to You). 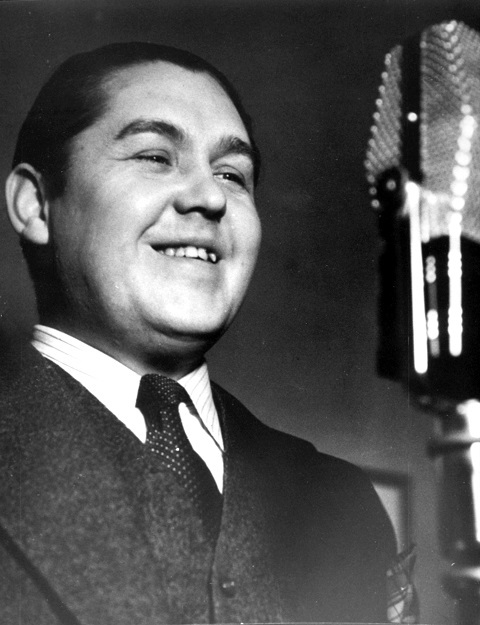 Waldimir, whose actual name was Sune Engström, was in 1935 working as announcer and head of the gramophone department at the Swedish Broadcasting Corporation, where he would later become conductor of Underhållningsorkestern (The Entertainment Orchestra). When the war was over in 1945, Jussi and his agent were ready to start reconquering the American audiences, and it was a larded touring schedule Jussi and Anna-Lisa had before them when they in the beginning of October left Sweden. It was on 27 February 1941 that Jussi took farewell of the US with a performance of Rigoletto at the Metropolitan, and little did he anticipate then that it would be more than 4½ years before he could return. When he was back on the Metropolitan stage at the end of November it was again as the Duke in Rigoletto, but then he had already almost two months’ touring behind him. “The Jussi Björling Memorial Foundation is since 1970 administrated by the Foundation Soloists of the Royal Theatre (SKTS), which bestow the Jussi Björling Award to outstanding singers and music profiles. Since 2009 The Anders Wall Foundation contributes the money. The award should not be mixed up with the Jussi Björling Society’s Prize. In the Autumn of 1950, Jussi and Anna-Lisa Björling came to the USA in October, and he had sung until January at the Metropolitan (where Rudolph Bing was the new general manager). He had, for instance, sung in a new role, Verdi’s Don Carlo, at the season opening in November. After touring in the US and Canada, he was then back on March 3 to New York for his only concert of the season in that city. 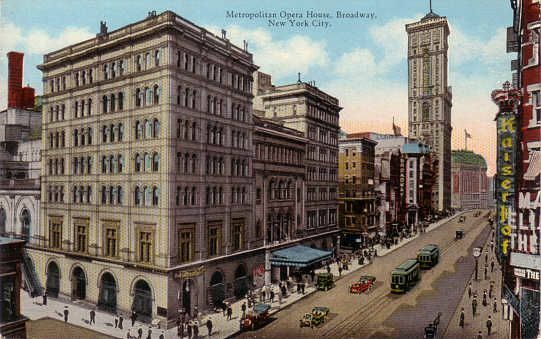 That was the second of his 6 total concerts at Hunter College, and as usual, he was accompanied by Frederick Schauwecker. The opening of the year 1957 was a decidedly hectic period for Jussi. He was in the fire as early as on 3 January with a performance of Tosca, where he sang opposite Birgit Nilsson and Sigurd Björling, and continued with another five appearances at the Royal Opera. In between he also managed to squeeze in a guest appearance in Zurich, again with Nilsson and Björling in Tosca, and back home he spent two days in the Great Hall of the Stockholm Concert Hall, recording five opera arias with the Royal Orchestra and Nils Grevillius. 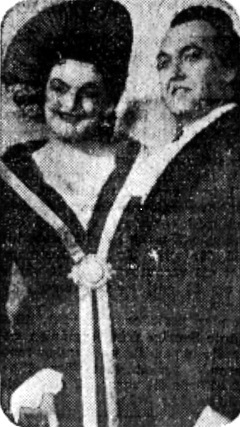 In January of 1941 Jussi had been in America since the previous October, for the first time without Anna-Lisa who had stayed home with the children. At the Metropolitan he had made his debut as Gustavus III (Riccardo) in Ballo on Dec. 2, and in January led off on the 8th with his 5th performance there of the same opera. As with the premiere and the broadcast of the December 13th perforamnce with Ettore Panizza conducting, Zinka Milanov sang Amelia and Stella Andreva Oscar. 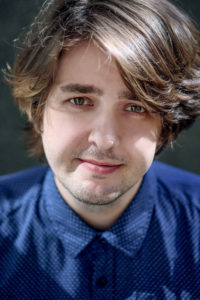 In January, Kerstin Thorborg sang Ulrica as she had at the premiere but not on the broadcast, and Francesco Valentino took over as Renato, following Alexander Svéd. The CD contains five recordings on nineteen tracks, the playing time is just over 68 minutes. It includes a very interesting 11-page booklet in English with texts by Harald Henrysson, Stephen Hastings and Christer Eklund. The CD is sponsored by the American, Swedish and British Jussi Björling Societies. It can only be purchased via the societies! During those years Jussi was able to celebrate Christmas in Sweden only once, 1949, but after a few weeks he was back in the States again. The autumn 1947 differed somewhat from the pattern, since he then didn’t cross the Atlantic until December. But he made however some guest appearances at the Royal Opera in Stockholm, the last one on 1 December in Tosca. In the pit was, as so often, Nils Grevillius and among the colleagues on the stage were Ruth Moberg in the title role and Einar Larson as Scarpia. In the morning papers that day was a short notice proclaiming: “Last guest appearance of Jussi BJörling. SOLD OUT!” Sold out it had been also two days earlier when he appeared in Bohème together with Helga Görlin, Henriette Guermant and Hugo Hasslo. In Dagens Nyheter the day after the farewell performance was a notice with the header “Jussi took a brilliant farewell” and it was also reported that he was paid tribute to the whole evening. On the photo attached to the notice was Jussi seen together with Einar Larson. 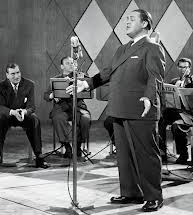 That autumn Jussi Björling had arrived in America at the beginning of October and given a couple of concerts the same month before singing on the 31st at Hunter College in New York, a performance the New York Times called "magnificent". After that, he began to prepare his third season opening at the Met (after Ballo in maschera 1940 and Don Carlo 1950), Gounod's Faust. In the US, Jussi had already sung the title role nine times with the Met between 1939 and 1951, and twice with the San Francisco Opera. After a fairly intensive summer of 1958, where in particular the latter part of August was filled – among other things Jussi sang at the Stockholm Stadium during the inauguration of the European Athletics Championship on 19 August – he in due time set off for the US at the end of September. Just as previous autumn it was primarily a matter of opera performances, with Verdi the dominating composer. 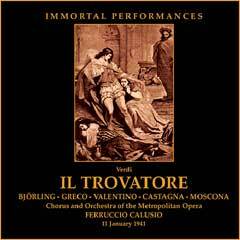 It started on the West Coast and then Il Trovatore was almost exclusively on the agenda. That month meant seven opera performances for JB in Stockholm, among which two debuts; a concert debut at what would be one of his most important open-air venues, and a gramophone recording. Jussi’s first role debut during the season took place on September 6, as the pasha Haroun in Bizet’s one-act opera. The opera was composed in 1871 and staged in an exotic setting, like the earlier Pearl Fishers, this time in a Cairo palace. The first performance outside France took place in Stockholm in 1889, and Djamileh was given there 26 times before it was re-introduced in 1933 with Kurt Bendix as conductor. Jussi would participate in the 6 performances given of the new production (all in that year and 3 of them in September). In Stockholm, the opera was played together with La boutique fantasque, a ballet by Ottorino Respighi based on music by Rossini. The weather wasn’t on best behaviour when this year’s edition of “Jenny and Jussi” took place at Skansen on Saturday 5 August 2017. It was windy – which isn’t unusual there – threatening dark clouds filled the sky and a couple of times they delivered. Not much though, it drizzled, but umbrellas and raincoats were produced. It was noisy as well. The audience at large was well-behaved but there was busy helicopter traffic above Stockholm, due to the big Pride Festival, where a parade of 45,000 walked through the city centre. What was offered from the stage was however pleasing. 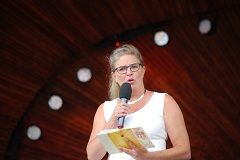 The compere Pernilla Eskilsdotter had cut down on her flowery language and presented the programme charmingly and unaffectedly. For this year’s concert to the honour of Jussi Björling – the seventeenth since the beginning – the mastermind behind the festival – or “perpetrator” as he calls himself – Stefan Olmårs had gathered a trio of young singers already in heavy demand, in spite of still being students at the University College of Opera in Stockholm. As usual the mainstay Lennart Eng was at the grand piano in the beautiful white Voxna Church, surrounded by flowery greenery. And people come from far and near. A busload of enthusiasts from Stockholm attended the second concert. On Saturday 2 May 1959 Ann-Charlotte Björling was confirmed at Engelbrekt Church in Stockholm. Jussi and Anna-Lisa had just returned home from New York and couldn’t manage to be present at the ceremony. Vicar Alvar Cedermark asked however Jussi whether he could imagine singing something at the morning service the next day, in connection with the confirmands’ first communion. He was willing to do that, and immediately after the ringing of bells he sang from the gallery Beethoven’s Song of Praise, “with eyes brimming over with emotions”, as those present could relate. According to other witnesses he also sang Land du välsignade. The documentation of Jussi Björling on this website has been essentially expanded in April 2017! 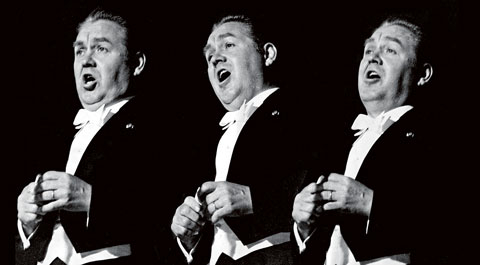 There is now a detailed chronology, in English and Swedish, of his more than three thousand known performances (see ”About Jussi Björling / Performances”). A list of all opera companies he sang with, including the number of his performances with them, has also been added (see under ”Performances”: ”Jussi in Opera”). At the same time, the list of his recordings has been updated once more. April 1949 meant the end of a long American tour for Jussi and Anna-Lisa Björling. For Jussi, it had begun in October of the previous year (his wife joined him later). 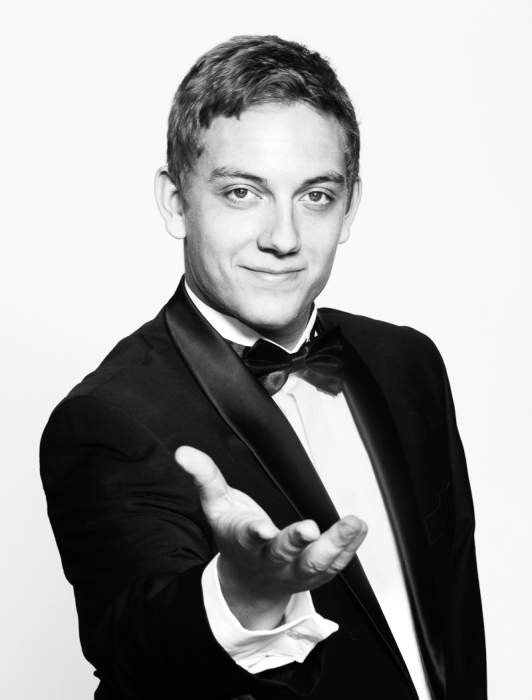 Jussi had sung with the San Francisco Opera and with the Met in New York, also on tour with both companies. As usual he had a full schedule of concerts and on a few occasions he had been joined on stage by Anna-Lisa. 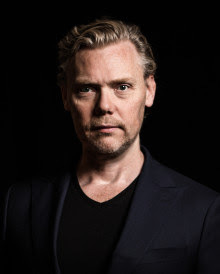 “Norwegian tenor Bror Magnus Tødenes is the recipient of this year’s prize. 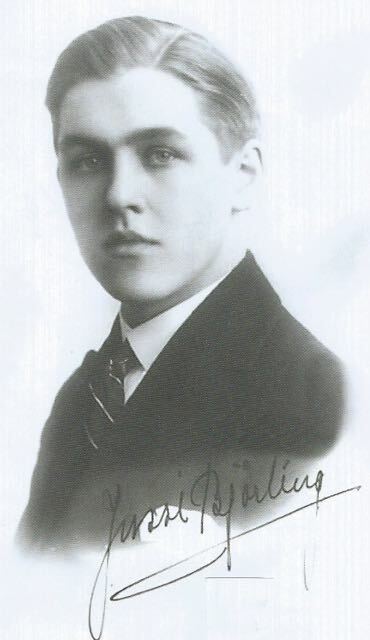 Our hitherto youngest prize-winner, who moreover has Jussi Björling as his household god among singers. It may seem bold to recommend such a young candidate. But his prerequisites for future successes within the trade of singing appear to be extremely good. 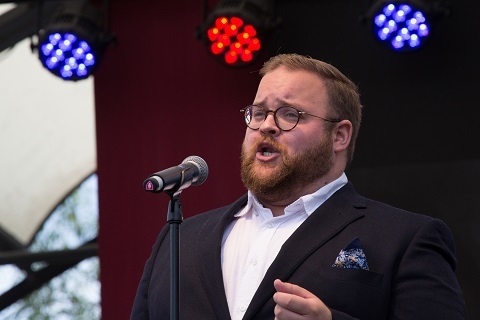 He has already attracted international attention and has been singing in both Salzburg and Vienna – cities closely associated with music and singing. At the age of 24 confirmation is decisively important and for that reason we want to draw attention to this promising tenor to a wider audience in this country and elsewhere. 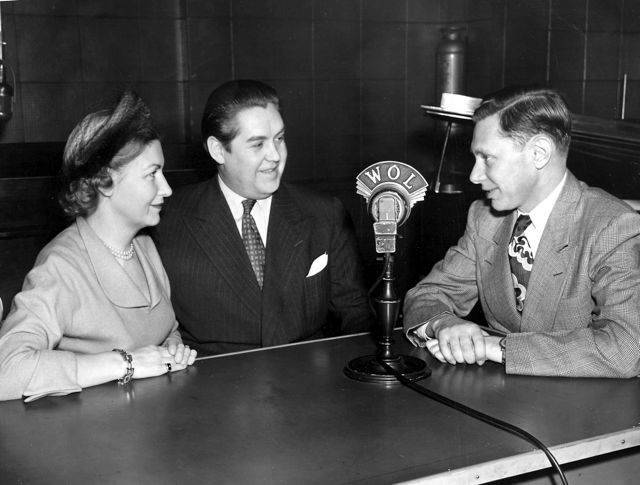 In March 1953 Jussi had, together with music journalist Teddy Nyblom, planned a tour of France and Great Britain with both opera appearances and concerts. Unfortunately Jussi contracted throat problems, and his long looked forward to debut at the Paris Opera in his signature roles as Faust and Romeo had to be cancelled, to the great disappointment of the Parisians. 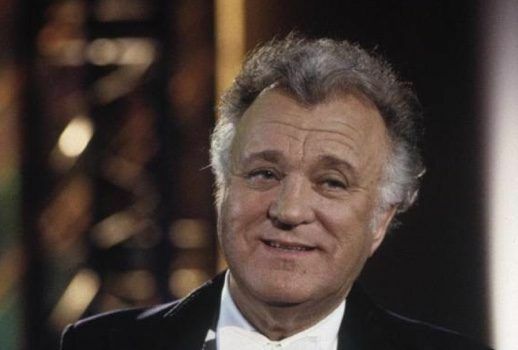 Our cherished honorary member, Royal Court Singer Nicolai Gedda, is dead. A paralysing emptiness surrounds me while writing these words. As it often is with utterly alive people who are available through their recordings, thus it is also with Nicolai. The immediate reaction on the news of his death was for me to at once play some favourite recordings and convince myself that an artistry like his, through the brilliant recordings from 1952 and all the way into the 21st century, can never really die. 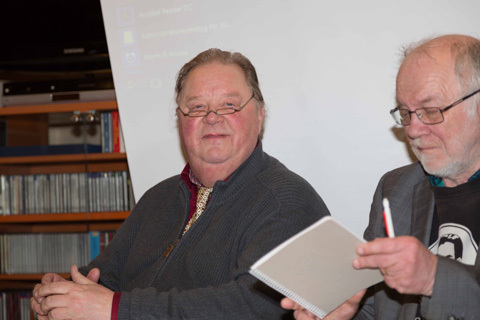 19 members had turned up at the annual meeting of the Jussi Björling Society on Saturday 4 February, which started at 13.00 at the Jussi Björling Museum. The meeting was opened by the chairman of the Society Bengt Krantz, who bid those present warmly welcome. In February of 1951 Jussi Björling had been in the USA since October of 1950 together with Anna-Lisa. 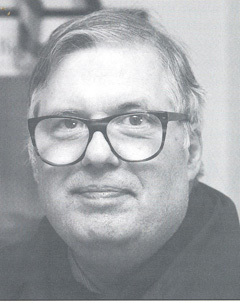 He had first sung at the Metropolitan, opening the season in a new role, as Verdi’s Don Carlo. This performance marked the beginning of Rudolf Bing’s leadership. Later the couple set off on a tour and on Februrary 2nd, when Jussi celebrated his 40th birthday, they were in Montreal for a joint concert, Jussi’s third there. 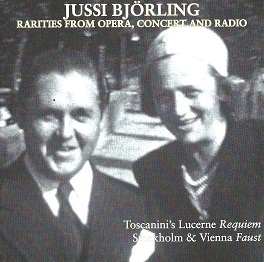 After some performances at the Stockholm Opera round the turn of the months August/September, Jussi spent the autumn 1956 in the US, where he appeared at the War Memorial Opera House in San Francisco and the Civic Opera House in Chicago, sandwiching the odd visits to Los Angeles and Detroit and a few concert appearances. The last one was on 11 December at the Brooklyn Academy of Music in New York, and then he could return home after four intensive months ‘over there’ and celebrate Christmas and New Year in the bosom of the family. 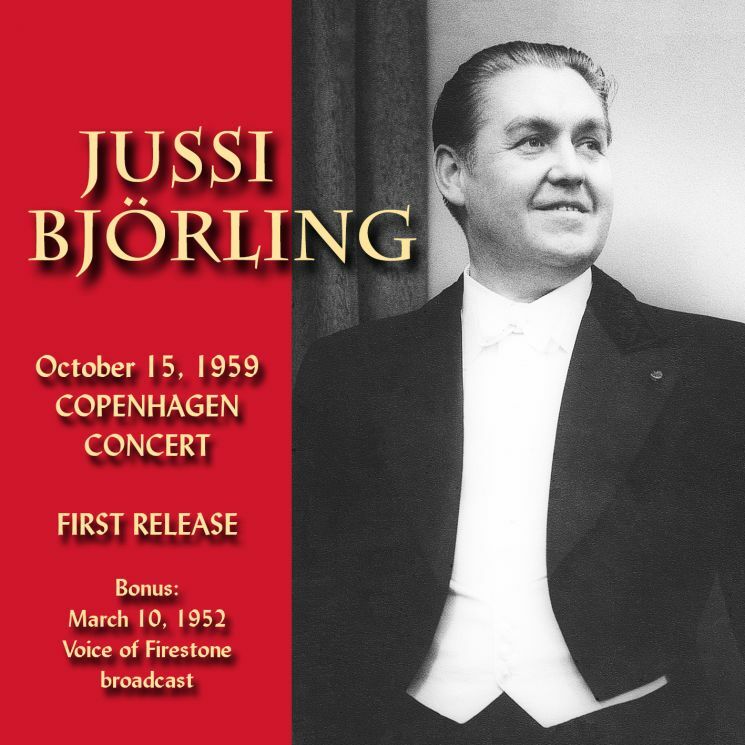 The newly released Jussi Björling Copenhagen Concert (JSP RECORDS JSP682) is the recording of the month on MusicWeb International. More can be read here. We have earlier written about it here. We had hardly reckoned on some previously unknown recordings with Jussi Björling would crop up. The record companies have the last few years hovered radio archives and other sources on anything imaginable. But then there pops up a tape in excellent sound quality, recorded in Copenhagen on 15 October 1959 in the then brand new Falkoner Centret – a concert hall with superlative acoustics seating 2000 listeners. In the venue there was also a state-of-the-art recording equipment, which was employed to record most of what was happening there – and then the material was hidden in the archives – until now. 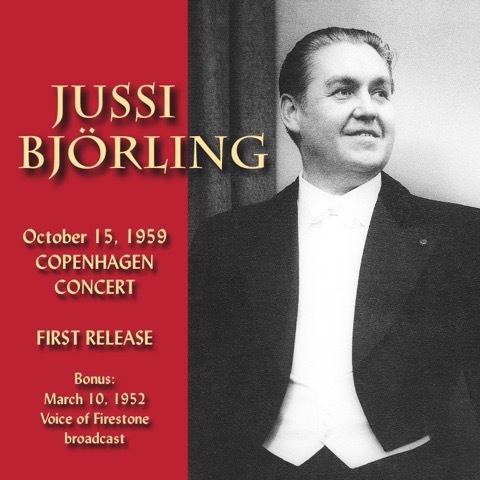 For the release in February 2016 of the CD JSP682, containing Jussi Björling’s 1959 Copenhagen concert and his 1952 Voice of Firestone broadcast, lyrics for songs and arias recorded with him are published on this website for the first time. He was one of the founders of Jussi Björlingsällskapet and was its Chairman 1995 – 2004 and after that Honorary Chairman. He was an amiable and witty person and his expressive presentations and interviews at the regular member meetings were highly appreciated. To the general public he was well-known as announcer at Swedish Radio, where he later became head of the broadcast management. Through his linguistic ability he was also a valuable member of the group for preservation of the purity of the language at Swedish Radio. 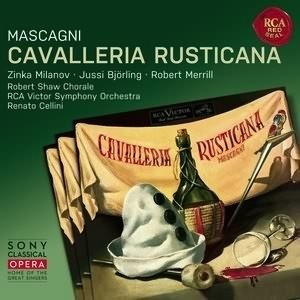 The first of Jussi’s two studio recordings of Cavalleria rusticana , which was made in 1953 with Zinka Milanov and Robert Merrill, has been reissued by Sony from the original tapes, during the autumn of 2015 (RCA 88875054492). There is a very wide choice of Jussi-recordings at Youtube, maybe about one hundred. Many times the same recording is uploaded by several different users. There are millions of visitors, the most views have O Helga natt, amassing 2 million views, followed by Nessun dorma and the Pearl Fisher duet with 1.4 million respective 1.3 million views. Visitors can leave comments and naturally the great majority are positive, in many cases overwhelming. 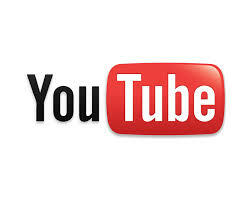 Click on the link and you will find a number of comments to some recordings on Youtube. 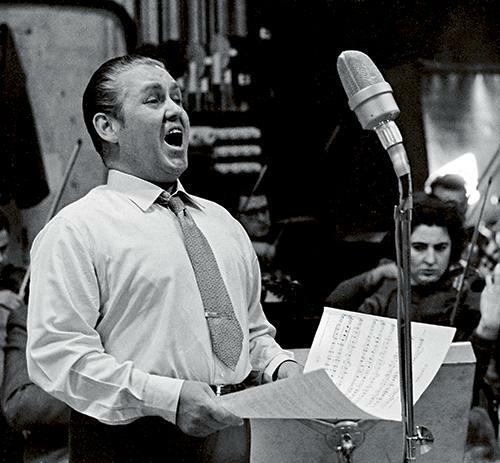 There are five live recordings of Jussi Björling as Manrico in Il Trovatore and one studio recording. 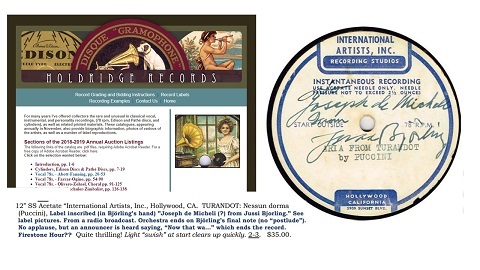 The second live recording, from the Met January 1941, was reissued in September 2015 on CD by the Canadian label Immortal Performances (IPCD 1052-2). The critic Henry Fogel in Fanfare is as impressed by the sound as by Jussi’s performance. He thinks that the sound engineer Richard Caniell ”has performed his usual miracles with the sound restoration”, and that the sound ”comes shockingly close” to a professionally made 1941 studio recording. The Borlänge Cultural Committee has decided to move the museum in connection with the building of a new art gallery in the library building. 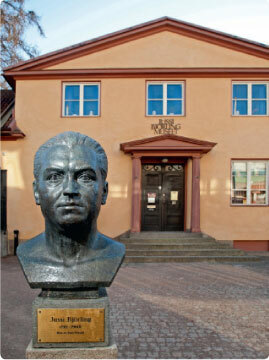 "The Jussi Björling Museum will become a part of the new art gallery, which will use premises that are not leased today. … The committee considers that in Dalarna, a large modern art gallery is missing, where great importance is attached to modern art and design and art for children and young people… Now the cultural committee has unanimously accepted the plans, and the financing of the costs taken by the city will be through the committee’s budget. … The art gallery will become part of the library, with the premises directly connected. There is a plan for this, which one hopes might be realized during the autumn..."
To the information in the newspaper might be added that is still unclear exactly what, or how large part of the building the museum would be able to use, and when a move might take place. 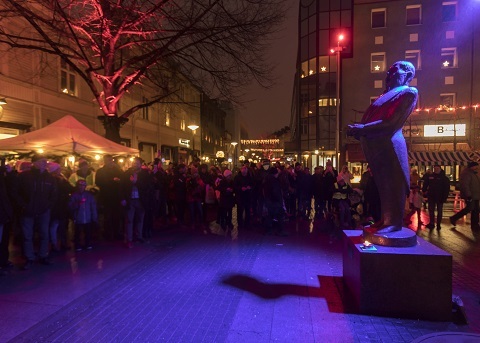 The opera about Jussi, Silverfågeln (Silver Bird) has been premiered. On 10 July the chamber opera Silverfågeln (Silver Bird) about Jussi Björling was premiered at Vattnäs Concert Barn in Mora, Dalecarlia, in central Sweden. The composer is Mats Larsson Gothe, the libretto was written by Greta Sundberg and is based on Yrsa Stenius’s book Tills vingen brister (available in English as e-book – The Heart of Jussi Björling). The opera has been reviewed by Dagens Nyheter, Svenska Dagbladet, Dalarnas Tidningar, Swedish Radio et all. It was broadcasted in its entirety by Swedish Radio on 8 August at 7 p.m.
A complete new version of ”A Jussi Björling Phonography” available on the website. All Jussi Björling’s recordings and their issues have been listed in Harald Henrysson’s ”A Jussi Björling Phonography” (second edition published in 1993). 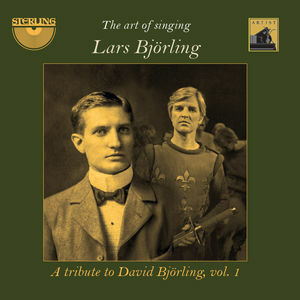 Since 2011, an updated version, including only issues on CD and DVD, has been available on the Björling Museum website and linked from this website. A print edition of that version was published in 2014. In June 2015, a complete revised version has been published on these websites for the first time. Included are 39 complete operas and 628 separately recorded songs, arias and scenes. 3044 issues in twelve formats, from 78s to CDs and DVDs, are listed. Items that have been signed by famous persons have always awakened great interest. Jussi Björling at seventeen had a well-developed signature that can only be characterized as elegant. His autograph has today high rarity value. So why is his autograph so valuable? Read about this in Stephen Crowley’s article Jussi Björling’s Autograph by clicking the link below. Stephen Crowley is Englishman and a member of the English Jussi Björling Society since its foundation. 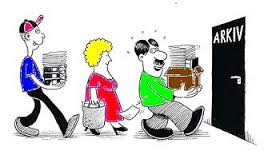 He is an inveterate record collector and has worked as dental surgeon. THIS TAPESTRY REPRESENTING JUSSI was embroidered in gold thread by Britt Marie Jern from Åmål. 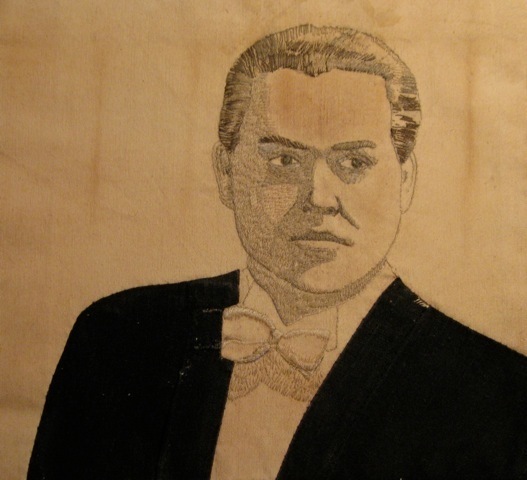 She is a member of the Jussi Björling Society and made this out of pure love of Jussi. Britt Marie is otherwise a prominent sculptor with many official commissions. The size of the tapestry is 106 x 87 cm. WELCOME TO HAVE A LOOK INTO THE ARCHIVES. There you will find selected items that have been published on our new homepage since it was introduced on 1 February 2014. You will find Jussi of the Month, what happened on our member meetings, you can browse through previous issues of our magazine, read about our summer concerts etc. The Favourite Arias of the Audience? THE AUDIENCES AT JUSSI’S CONCERTS had many favourites among all the opera arias he had in his repertoire. But there was one in particular that was the most requested. Which one? Listen to what Jussi had to say about this in a radio interview from 1958. Prices for Members of the Jussi Björling Society for the Full Assortment of the Museum, CD, DVD etc. By clicking the link below you will get access to the Jussi Björling Museum Special Price-List for members of the Jussi Björling Society. The price-list encompasses the full assortment of the museum and certain prices are extra reduced during the summer. Postage may be added. 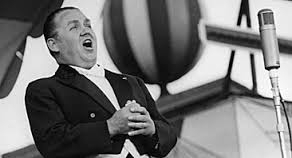 WE WANT TO SHARE the beauty of Jussi Björling’s singing and tell about his fantastic career on this website. We recommend you to take part of information from these societies by clicking the links below. 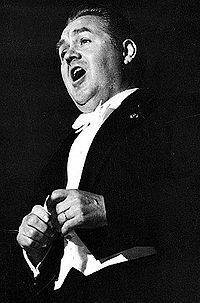 JUSSI BJÖRLING IS ONE of the greatest tenors ever. His life and his musical journey through life continues to fascinate generation after generation worldwide. He is loved, not only for his music, but also for being a human with strengths as well as weaknesses. Here is the story of his life. JUSSI VERY RARELY gave radio interviews. Here we have managed to collect seven of the so far known recorded interviews in chronological order, recorded 1951 – 1960 with playing time totalling ca. 53 minutes. Most of the interviews are in English. Support us in our activity to keep the memory of Jussi Björling alive! 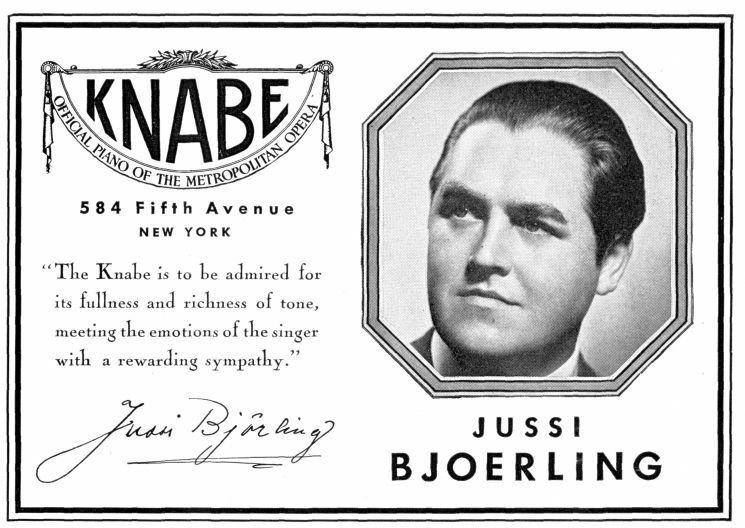 Now it’s time to renew your membership in The Jussi Björling Society. Recently you received the latest issue of our membership magazine (only in Swedish) with information leaflet and paying-in form enclosed. The subscription fee for 2016 is unaltered (see paying-in form). You like Jussi, don’t you? In that case you should of course join our society! 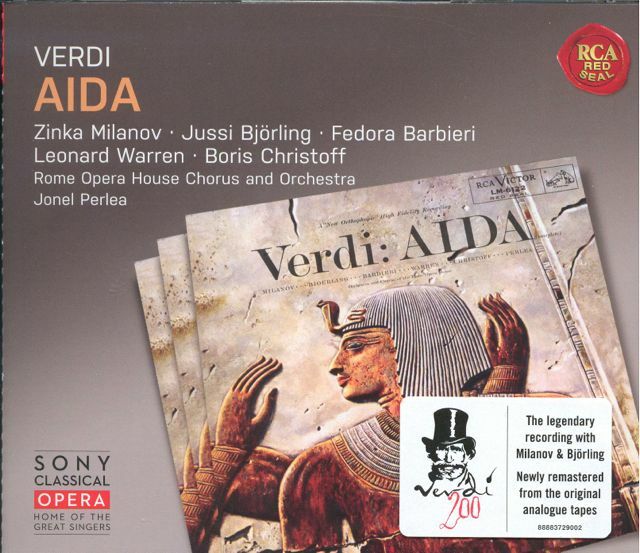 THE 1955 STUDIO RECORDING of Aida where Jussi Björling is partnered by Zinka Milanov, Fedora Barbieri, Leonard Warren och Boris Christoff, is generally regarded as one of the best ever, and it is the only Aida preserved with Jussi. HERE YOU WILL FIND a great number of filmed features with Jussi, recorded 1937 – 1957. 14 filmed recordings with Jussi in top-shape, mainly recorded at Jussi’s appearances on American TV during the early and mid-fifties. JUSSI’S GREAT POPULARITY meant that his name was exploited commercially in advertisements for various products, like throat pastilles, razor blades, pianos and even beds!